Kakadu National Park - Crocodiles. There are a number of safety-related aspects of travelling in Kakadu National Park: crocodiles, disease-carrying insects, large feral animals, dehydration, and what to do if a member of your group gets injured or lost. External Link On Crocodiles, Swimming in pools and gorges, Disease-carrying insects, Large feral animals, Dehydration, Lost or injured group members, Wildfires, Flash flooding, Emergency telephone numbers. Northern Australia is crocodile country. Therefore it is important to put awareness of crocodiles and safety at the top of your priority list when living in, working in or simply visiting crocodile habitat. 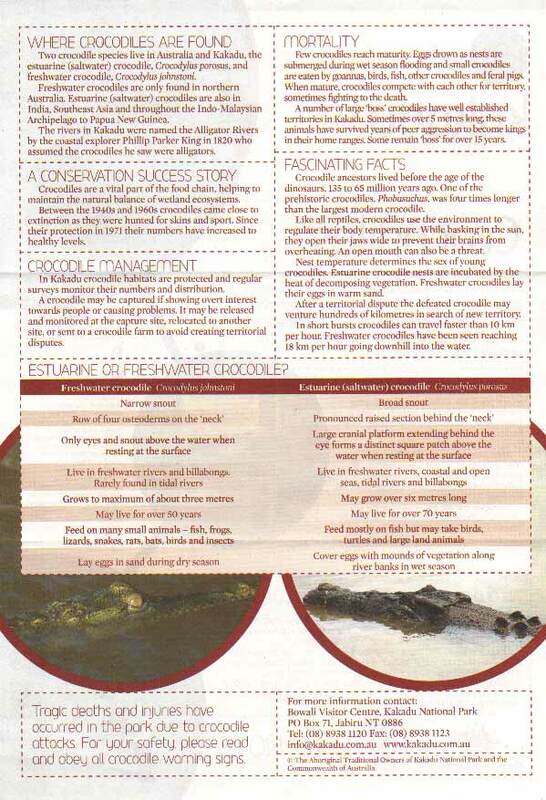 Living with crocodiles is not difficult so long as you bear the following points in mind. • Always be aware that crocodiles may be present anywhere that there is water. • Unless there is clear signage that it is safe to swim, assume that crocodiles may be present. • Warning signs are there for your benefit! Ignoring them is foolish. • Always check with local authorities and rangers whether an area is likely to contain crocodiles. • If in doubt, always swim in designated swimming areas only. • If there's no sign, don't go swimming. • A spotlight or LED head-torch is strongly recommended at night so that any eyeshines can be seen, but a lack of eyeshines does not mean that it's safe to swim - crocodiles may be underwater. Swimming in Kakadu will pose a threat from Crocodiles in the Northern Territory. 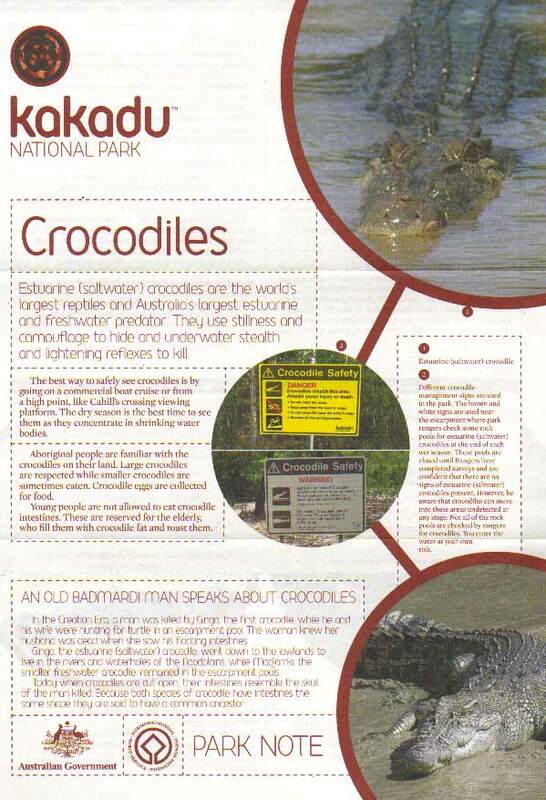 Though please check with the National Parks Headquaters in Darwin, Tourism Top End, Bowali Visitors Centre on the way through to Kakadu and always look for and heed any warning signs including Crocodile warning signs. Often there are friendly rangers at the bigger falls, tourist information centres and government websites for more accurate infomation. See more on swimming below. Are there certain times of the yea r that I can’t swim? How can you identify if a water-hole is safe to swim in? Salt and freshwater crocodiles are found in most Top End billabongs and rivers, and are occasionally seen on remote beaches. The accessible rivers and billabongs are generally sign-posted if saltwater crocodiles are known to inhabit the area, but if you are not sure, don’t swim. Swim only where recommended and always observe and read the crocodile warning signs. Aren’t swimming spots hard to get to or only acesible as part of a tour?